Inquirer Staff Writer Peter Mucha broke the story on Philly.com today stating that Rina Cutler, deputy mayor for transportation answered a question about new north south bike lanes by Councilwoman Blondell Reynolds Brown. Cutler did not specify which streets will be targeted but she later stated - "We expect sometime in late April to be announcing the pilot streets, as well as the enforcement program". Meanwhile back on the internet, the bike hating idiots are spewing their vermin in the article's comments section, you can help the cause by signing in to Philly.com and saying something positive about bikes. 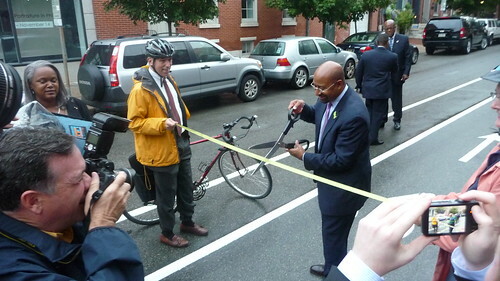 Will the Mayor take the scary scissors to another set of bike lanes this year? I am so excited to have a future south bound bike lane. I use the northbound 22nd street bike lane everyday starting south of Passyunk Ave and then I go east on Pine - I almost have a bike lane all the way up to the Ben Franklin bridge (it's fast and so much safer than my trip home). My trip home is west on Spruce and then south on Broad. My trip down Broad is where most of my close calls happen and where I experience the most road rage from drivers.